Great report by Bloqboard on decentralized lending activity occurred in 2018, when a whopping $250M worth of crypto denominated loans and borrows were routed via open protocols and settled on public blockchains. "the most interesting aspect of MakerDAO is the fact that its interest rate (‘stability fee’) is completely independent of the Fed funds rate. It has seeded a new borrowing rate — one that is highly competitive and sustainable due to its robust cryptoeconomic ecosystem." In depth piece exploring the implications of an at-scale CDP market with MKR. 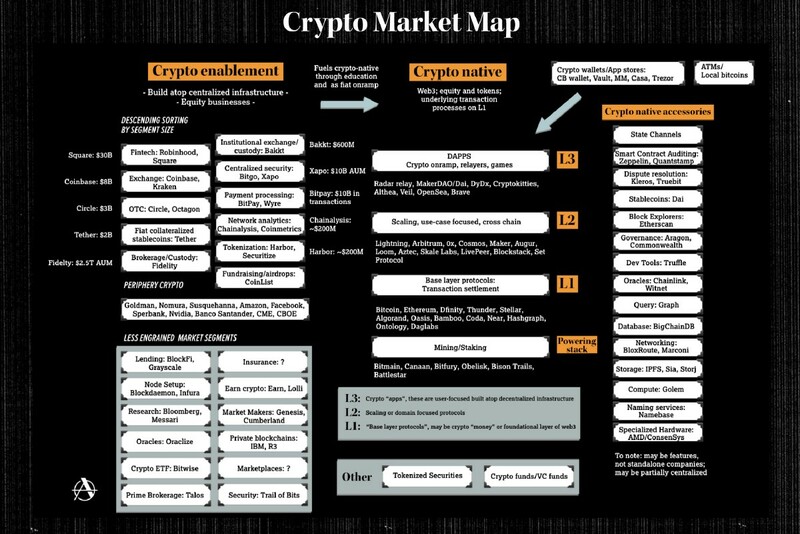 Well structured and articulated crypto market landscape by Ash Egan of Accomplice. A data rich insight into what goes on under the Ethereum hood on any given day by Token Analyst, highlighting the complexity of contract to contract interactions. Missed from last week. A survey of 160 DApp project developers and founders carried out by Fluence. Some interesting insights into tech stacks and current bottlenecks. New report by Jerry Brito of Coincenter on the importance of fostering a privacy-preserving currency for an open society: The Case for Electronic Cash. Jameson Lopp shares the key themes emerged from the latest Satoshi Roundtable, touching on Lightning, privacy, sidechains, security, security tokens and Grin. Speaking of Grin, here's a good overview of its informal governance structure and processes, by Derek of Blockchain Capital. If you have a hard time understanding long and short shares on binary bets, and / or why a UI like Veil makes sense on top of Augur, this is a good explanation. Extremely in-depth analysis of LBC volume and trends. The conclusion gives chills: "in the 4th quarter of 2018, as Bitcoin price and interest seemed to hit their doldrums, 23 countries on LBC had their best quarters ever. Almost all of these countries are in the developing world." The concept of allodial title, even if trivial, definitely helps in putting things into context when we think about asset ownership in the new decentralized world. Taylor always bringing it all back to reality. This is a MUST READ for anyone developing a dapp. A quick article recapping what is going on in Cosmos-land where the genesis of their Game of Stakes PoS implementation was already successfully sybil-attacked. One of the developers of CryptoKitties shares why Progressive Decentralization might be the best path towards building software that is usable by end users. A pretty good read for anyone building a dapp. A decentralized, unstoppable and uncensorable alternative to Patreon is here, built on Blockstack and using BTC on-chain or Lightning for payments. Creators will 'own' their patrons and their data and no one will be able to censor them financially. Just how it was meant to be. More details on how it works under the hood here. Great and healthy initiative by 0x to curate legal and regulatory resources to help the 0x ecosystem navigate through some the key legal issues facing the industry. You may want to bookmark this one in case you are building a defi product. A stablecoin relayer with fiat on-ramp, built with 0x and Wyre. So far the alpha version lists USD and KRW pegged stable tokens, however the long term play here when more fiat currencies get their tokenized version is to become the crypto forex trading platform. A glimpse into the future of open finance investing with Abra's latest feature, which enables anyone (from a list of 155 countries) with bitcoin in her wallet to invest in traditional stocks, commodities and ETFs. Abra is deploying the same technology (crypto collateralized contracts) used already for trading of crypto assets and fiat currencies to other asset classes, taking the risk of price movements in the collateral and hedging it away in the open market. A brand new block explorer for Grin, by the Etherscan team. Opera's browser based wallet gets a fiat on-ramp thanks to an integration with Safello. For now Android users in Sweden, Norway and Denmark will be able to add ETH to their wallet using debit/credit cards (subject to KYC though). In case anyone missed the note, Google is deploying some of its smarts onto making blockchains searchable with BigQuery, now covering 6 more on top of Bitcoin and Ethereum. Forbes had a great coverage of Google's latest moves in this space in "A Technical Breakdown Of Google's New Blockchain Search Tools". For all the Augur fans. Still in development mode, but someone is working on a 0x relayer to trade volatility markets (ie options) on Augur. Worth keeping an eye on this and others coming out of the 0x+Coinlist virtual hackaton. DAI users gets another super sleek interface to manage their CDPs in Bloqboard, which already integrates with Dharma and Compound. Wyre is on an absolute roll. It now integrates with AirSwap, enabling a P2P OTC-style fiat-on-ramp via ACH/wire into its wallet-to-wallet trading app. Interesting to see that there's someone building on Tezos. Marigold is basically Vitalik's minimum viable plasma ported over. The team at Neutral has unveiled their Neutral Dollar. NUSD is a new stablecoin of stablecoins 🤯. It's an equally-weighted basked of DAI, TUSD, GUSD, PAX, USDT, and USDC. Going with a meta stablecoin substantially lowers the volatility of the asset. We continue to be impressed by the InstaDApp team (other than for the name). Their v2 will be a mash up of many defi protocols, with a plan to use excess 'float collateral' to generate cashflow on third party platforms. Harbor is going full-steam. They have released their Platform 2.0 which provides a customer-branded solution for fundraising and issuing startup equity. Really making the dream of tokenized real assets closer to reality. Looks very clean. Another slightly unusual one this week: a state-backed regional fund (GO Philly Fund) is raising $50M for a blockchain focused fund to invest in startups located in the broader Philadelphia area. The $15M first closing comes from institutional investors like EPAM Systems, Pennsylvania’s Ben Franklin Technology Partners, Provco Group, Fulton Bank and SRI Capital, while the remaining $35M will be raised via a STO (powered by the Securitize platform). IDEO is sharing that they've already been working with a lot of top crypto teams, and have made six initial investments into ZeppelinOS, Messari, Rare Bits, Handshake, Freelance Labs, and a new stealth gaming company. They will invest in and co-create with early-stage distributed web startups to help them ship new products and protocols. Dharma Labs, the makers of the decentralized lending protocol, have closed a $7M round led by existing investor Green Visor Capital and participated by Coinbase Ventures, Polychain Capital, Y Combinator, Passport Capital, Blockchange and Ripple’s Xpring fund. The funding seems geared towards taking to market Lever, an application built on top of Dharma's own lending smart contracts that allows traders to execute high-volume non-custodial margin lending of crypto assets competing with centralized alternatives, BlockFi and Genesis and to some extent with decentralized dydx/expo, Maker etc. Dharma took the non ICO route back when every man and his dog was doing one, so it's now flexible enough to explore more traditional monetization routes with a fee making business such as Lever. Donut has raised a $1.8M (€1.6M) Seed round led by Redalpine with participation from AngelList’s Philipp Moehring and Andy Chung, N26 Bank board member Marcus Mosen and former N26 CMO Kelly Ford; for a "new home for your digital assets".